Is there more than one kind of finish for natural stone surfaces? Yes. Finishes are typically polished onto the stone surfaces before they are shipped to the fabricator. Granite and marble usually have a polished (shiny) finish, whereas limestone and travertine usually have a honed (matte) finish. However, this can be reversed in some cases. Yes. Stone has natural pores that may allow food and liquids to penetrate the stone and cause staining, discoloration, and in rare cases, etching. As a preventive measure, Great Lakes Granite Works applies a high quality impregnating (absorbed into the pores of the stone) sealer to all natural stone surfaces during the fabrication process. If your sealer is doing its job, water should bead up on the surface. How often should I seal my granite surface? If a high quality warrantied sealant was applied during its fabrication, you should not need to reseal for five years or longer. Although you can reseal it yourself, we recommend having a professional clean and reseal the stone for you. 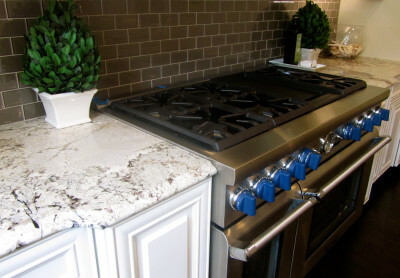 How does granite hold up compared to laminate and solid-surface counters? Under normal use, granite will not scratch, chip, stain or burn. It is heat resistant, so you can put oven-hot pots directly on granite. Kitchen knives will not typically scratch granite, but granite will dull knives. However, diamonds, sand and stones can scratch a natural stone surface, so take care to place pads under these items or avoid placing them on the surface. Can granite chip or crack? What can be done if it does? Granite can chip from a high-impact blow, such as dropping a heavy pot directly on the surface, or hitting the edge of the counter with a hard object. If this occurs, chips can be repaired on-site with granite dust or a matched epoxy mix. Granite can crack if a person stands or sits on the surface at a weak or unsupported area. Granite is most susceptible to cracking when it is being moved during fabrication and installation. Once installed, it is virtually indestructible. Note: Granite also has small fissures throughout that are often mistaken for cracks. These are a natural part of the stone’s formation, and they will not become cracks over time. I have noticed small pits in some stone surfaces. Should I worry about these? Pitting is a result of the natural formation of stone underground over millions of years. Some surfaces that are rich in quartz and mica will show more obvious pitting. These pits will not enlarge or multiply. How does marble compare with these surfaces? Marble is softer than granite and will scratch, stain and chip more easily. Acids such as citrus fruits and juices and vinegar will etch marble. You should treat marble as you would a piece of fine wood furniture. You can see all the available styles on our edge profiles page at glgraniteworks.com/edge-profiles. How thick will my stone surface be? All granite comes in a 1 1/8” (3cm) thickness, and a few colors offer a 3/4” (2cm) option. If a greater thickness is desired Great Lakes Granite Works can laminate edges. Will my cabinets support the weight of natural stone? Any cabinet that is well constructed and has been accurately installed will hold the weight of natural stone. How much overhang can I have without support? You can have up to 12” of overhang without support brackets or corbels, depending on the length of the overhang. Brackets/corbels should be placed every three to four feet whenever the overhang exceeds 12”. The brackets should be 3” less than the width of the overhang. Although lead times vary during the year, you can generally expect a wait of 7-10 business days from your measure date. Why is one slab of granite more expensive than another? Granite pricing is based on several factors; available supply, the production capability/volume of the quarry, and the aesthetics of a particular slab – its color, pattern ‘movement’ and veining. Please send it to us at glgraniteworks.com/contact and we’ll consider adding it to this list. "Amazing! From template to install took one week. I needed to change my appointment and it was hassle free. Carrie and the staff are amazing, accommodating and very knowledgeable."